Tuning Fork Lodge is large enough to host 14 guest be them friends or family. The large circular drive gives ample space for multiple vehicles and boats. A front porch entrance leads into the living room kitchen great-room where everyone can be involved in the up to the minute activities. The living area is furnished with recliner seating in front of a stack hearth gas burning fireplace. A flat screen TV with Direct TV package (PPV not available) is mounted on the hearth. Two sets of french doors lead from the living and kitchen area to the wrap around porches where you will find spaces for relaxing, cooking and more entertaining. The kitchen is equipped with gas cook top with electric oven, side-by-side refrigerator, microwave, large farm basin sink, and beautiful granite counter tops. The plentiful cabinets are stocked with dishes, glassware, eating utensils, bake ware, pots & pans and cooking utensils. Dining for multiple guest can be accommodated with the large table or island counter bar stool seating. Downstairs are four of the bedrooms. The Eagles Nest is a king bed master suite located to the right off the hallway. A private bath is within the suite with large tile shower and double vanity. 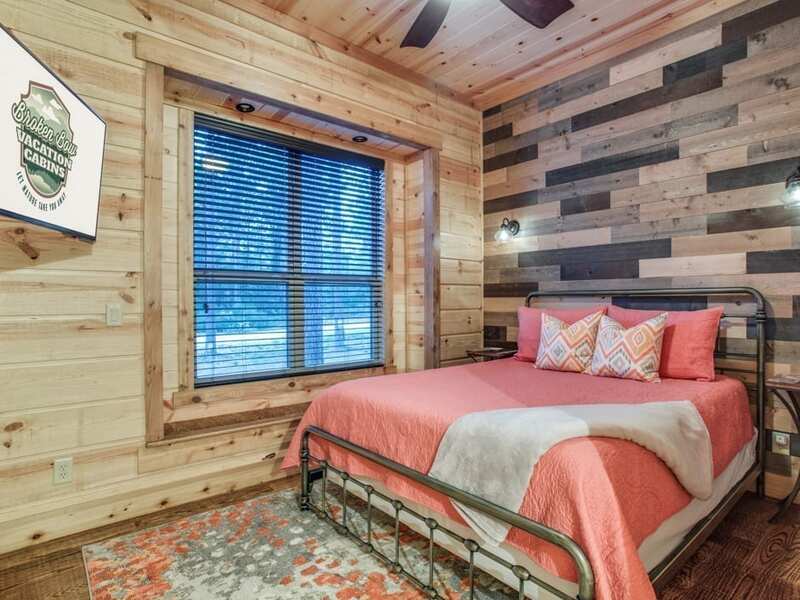 This bedroom has a private door to the back deck and hot tub area. Another door leads to a sitting porch that is shared with another bedroom. The Grey Wolf is a king bed master suite located to the left off the hallway. This bedroom has a shower and double vanities. The Coyote Cave is furnished with a queen bed. This bedroom has attached bathroom with shower/tub combo and single vanity. Down the hallway is the Bear Lair with king bed and a door to the sitting porch shared with the other bedroom. This bedroom shares a Jack-N-Jill bathroom with the Bunk Hall. The Bunk Hall has four twin bunks. All bedrooms have flat screen TV with Direct TV package (PPV not available). Upstairs has an open game room/entertainment area with pool table, sofa and flat screen TV with Direct TV package (PPV not available), and reading nook along with a sleeping area with queen bed. There is a half bath upstairs. The outdoor deck and yard area offers multiple seating options, a large dining table, gas cooking grill (propane provided) granite counters for meal preparation and serving along with a seating arrangement in front of a wood burning fireplace. There are a flat screen TVs mounted on the hearth and in the outdoor kitchen area. On the gravel yard there is a circular fire pit for wood burning fires where you can roast marshmallows for making S’mores. There is a child’s play set along with heavy double swings for the entire family to enjoy. Located in Lost Creek development you are only minutes away from local eateries and entertainment of the Hochatown Saloon and Restaurant, Hochatown BBQ and Ice Creamery, The Petting Zoo and other attractions. North 5 minutes you will find Hochatown Distilling Co., The Tasting Room Bar, Shuck Me Seafood Restaurant, Knotted Rope Winery and Mountain Fork Brewery and Pizza. View our tab titled Things To Do to find other area attractions as well as their contact information and locations.